The USNS General Hoyt S. Vandenberg off the coast of Key West has become a main attraction for divers from all over the world! She is the 2nd largest artificial reef, measuring in at 522’ long and 11 stories tall! Due to Hurricane Irma’s impact the ship now sits at its deepest in 165’ of water. The main deck lies between 100’ and 105’ with the tallest super structures ranging anywhere from 55’-70’ deep. It is at the top of the structure that most of the ship's interesting attributes are located, some purposely cut from one part of the ship and welded elsewhere to make attention-getting dive spots from bow to stern. Don’t forget to dive your certification! If you are an eager Open Water Certified diver and want to dive The Vandenberg, Lost Reef Adventures require everyone to have dove within the last 6 months to a year, have 10-15 logged dives outside of your certification dives, and hire a guide to show you a great time while keeping you safe. Open Water divers will require a guide. Guides are available for your convenience. We offer morning and afternoon dives on the Vandenberg as well as double dives. Please call (305-296-9737) for specific daily dive schedule. 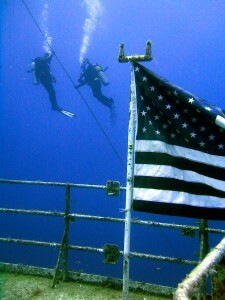 Photos of recent dives on Facebook at Lost Reef Adventures!! Fun facts about the ship! Height: 100 feet from keel to highest point. The ship was built in 1943 by Kaiser Shipyard in California. Originally named the USS Gen Harry Taylor, she was commissioned as a troop transporter, carrying personal during the last years of WWII. She was the first ship to return to New York Harbor after the surrender of Japan and stayed in service until 1958 when she was decommissioned. In 1961 the ship was acquired by the Air Force and re-comssioned as USAF's Gen Hoyt Vandenberg as a missile tracking ship. In 1983 she was re-acquired by the Navy and continued to serve as a missile tracking ship until she was retired in 1983.